Donna and myself (Newt) and Reggie our Golden Retriever have been full-timing since 2001. We had bought a Winnebago 38' Vectra a couple years before and taken several trips. We enjoyed the freedom to explore and the convenience of carrying your own home with us. I enjoy Photography and traveling around the USA in a motorhome certainly gives one the chance to do that. I also love to travel and see new things, especially natural landscapes and wildlife. Our opportunity for full-timing came when several things in our lives converged: loss of both of our jobs (due to age discrimination largely... in my opinion), the graduation of my daughter from high school and her desire to go to college away from home, a large and suddenly unaffordable mortgage, the desire to simplify our lives as we became the age eligible for AARP membership, and a need for freedom. We yearned for freedom from the monthly mortgage, the bosses that go with a regular job, the constant repairs dictated by a house, the responsibility of parentage, and the freedom to travel and be anywhere, anytime we wanted. We sold our home, but thanks to the 9/11/2001 disaster we had to wait another year to finalize the sale (after a loss of $40k in sale value). We were extremely happy to be free of the house and most of our possessions once we did sell. We eventually bought a 2003 Alfa Motorhome and have enjoyed living in it with all of it's space and comforts. We have several computers, internet satellite system by Motosat, embroidery machine and lots of toys that keep us busy no matter where we stay. We have been doing this for almost 9 years now. We still enjoy it although some of it has become a bit stale due to our comfort in going to the same places year after year. We do need to mix it up a bit, but by in large we still like the RV lifestyle. 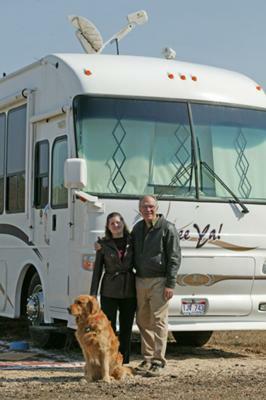 Our RV allows us to be relatively free of financial strains. We don't need too much to be happy. We encourage you to try the lifestyle after you've made sure it sounds like something you'd enjoy. I enjoyed your article. Funny we are in a very similar situation that you were. I love photography and developed software. I was curious how you liked your Alfa Motorhome? I love the features but have run into few who own one. Opinions seem to either be very negative or very positive. We are full time Rvers also, and don't have the typical financial strains associated with a stick house. We love the freedom and the stress free lifestyle. Thanks for sharing your story, we enjoyed reading it. Wow! Nine years of full time rving I'd say you really are experts of the RV Lifestyle. What are your normal stopping places that you're bored with? How are you planning to mix it up a bit?